As of October 27, 1947 there were but a handful of rock ‘n’ roll records that had been released. There were no hits among them, well… none that had made the charts yet anyway. The style of music had been fermenting in the fevered brains of a few ambitious souls for awhile by this point but it was only in September of that year that the results of those visions came into being in a way that could be definitively documented for history. Should there be little or no public response to any of those records and the men and women who made them then rock would’ve died a quick and quiet death, its artists either stubbornly forging ahead with the same intent but with fewer opportunities for mass exposure, or more than likely they’d have thrown in the towel on these wild experiments and headed in another direction entirely, probably one that had a little more of a track record behind it so as to bolster their chances at maintaining a career in music rather than simply playing house rent parties, fish fries and an occasional gig at a local club where the cockroaches along the baseboards outnumbered the customers sidling up to the bar for a drink and song or two. We know of course that didn’t happen. We’ve seen the rock movement rapidly progress from a loosely knit collection of somewhat disparate sources which somehow found sympathetic ears amongst a new generation of restless and optimistic black Americans eager for something to reflect their outlook and call their own. Buoyed by this response the style coalesced in fairly short order with artists trying out what seemed to work and shedding more and more of those holdover ideas from the past until it became what we see each day before us now in mid-1949 – a firmly established genre growing bigger and more popular by the minute with clearly defined boundaries and an artistic hierarchy determined by the releases of the past year and a half. 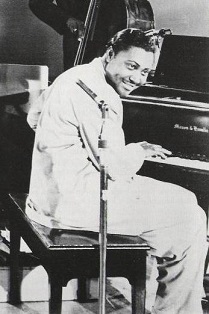 Sitting atop that pyramid of rockers as we speak is Amos Milburn, somebody who for the first half of that journey had no hits to his credit, no broad name recognition and no assurances that the commercial tide would turn for him. But what he DID have all along was the definitive sound of rock ‘n’ roll coming out of every pore in his body. The thing about it is, he had it from the very start… if only anybody had bothered to notice. Which brings us back to October 27, 1947, for that’s when Amos Milburn stepped into a Los Angeles studio and cut a fistful of tracks that proved, beyond any doubt, that rock ‘n’ roll was already coursing through his veins. Though two thirds of the tracks were the kind of melancholy piano blues that were popular at the time – and certainly Milburn pulled them off effectively enough to ensure he wouldn’t have to wait tables or paint fences for a living should rock not pan out – the remaining third were the sound of tomorrow. The first example of this was the storming Bye Bye Boogie which kicked off the release rolls for January 1948 and left unsuspecting listeners feeling battered and bruised from the torrid pace, pounding piano and exuberant vocals. Somehow it hadn’t become a hit – maybe Aladdin Records wasn’t quite up to marketing it to the extent where it’d get heard nationally, or maybe the audience wasn’t ready for such a pure dose of narcotic rockin’ and rollin’ yet and so the label turned back to the more introspective sides for his next few releases. All of it was good, some of it frankly was pretty great, but it wasn’t enough to get him noticed amidst the din of honking saxes and shouting vocalists who were openly sinning and drawing the most attention for their crimes and misdemeanors. No matter, for in the fall of ’48 Aladdin finally released the best of his songs cut in late 1947 in Chicken Shack Boogie which acted as both a succinct recap of rock’s first year as well as a clarion call for the excitement still to come. With that immortal record Milburn broke into the ranks of the hitmakers and hadn’t looked back since. Each and every release to follow landed him in the Top Three on the national charts and he was unquestionably the hottest artist in all of rock heading into the summer of 1949. Yet “Chicken Shack” aside the rest of his hits that followed, including the top side of this release – In The Middle Of The Night – were ballads. Now truthfully he carried those off just as well as he did the uptempo numbers and in doing so he helped to make sure that the slower songs wouldn’t be excluded from the rock lexicon, but in order for him to really cement his legend and leave no doubt as to his versatility Amos Milburn had to remind everyone that he could rock out with the best of them. On Pot Luck Boogie he does just that, upping the ante for all of the contenders for the ever changing throne for the King Of Rock ‘n’ Roll. What’s most pleasing about this record is the fact that it’s an instrumental. The instrumental in today’s rock circa 2018 is all but extinct, at least when it comes to hits, but for decades instrumentals provided a much needed respite from voices and lyrics and allowed listeners to just get down. Rock certainly benefitted from this when starting out. In fact as stated on these pages many times before, the success of the sax instrumental in rock during the 1948-49 period is arguably what propelled the genre as a whole into the upper echelon of music commercially speaking as well as ensuring that the drive and excitement rock embodied was sure not to be missed. The mindset of the postwar young black listener was something that needed the freedom those songs provided. The downhearted laments of the blues, the more elaborate technique of jazz and the polite respect shown with pop ballads all still had a role in the black community as well as with their older partisans who preferred those more familiar touchstones, but the generation coming of age was ready to break free of the shackles society had placed on them and to do so they needed a soundtrack to reflect that. The rock instrumental gave it to them and then some. There was no sense of civility and orderly politeness to most of these records. They were loud and obnoxious at their best and repetitively crude at their worst, but in both cases they were entirely effective for conveying the sense of mounting anticipation for a revolution everybody listening hoped was coming. And it did come at that, except it wasn’t so much a social revolution which did away with restrictive Jim Crow laws and second class citizenry as was hoped, as much as it was a cultural revolution that nobody truly expected which would soon elevate this rambunctiously sleazy music called rock into the heart of the white mainstream through their own dissatisfied, curious and impatiently rebellious teenagers. That such a transformation would take a few years to work its way from one demographic to the next was hardly a surprise, but that fact it had the power to do so eventually was a subtly important stepping stone in the larger civil rights battles ahead. But in 1949, or 1947 for that matter, the eventual outcome of all this noisemaking wasn’t foreseeable, what mattered was getting yourself noticed by virtue of your playing. Milburn had that part down pat even if to date he hadn’t been encouraged to exhibit it in quite this way. Pot Luck Boogie is Milburn’s first instrumental in the rock era. His last record sans vocals – Real Gone – had been released in mid-1947 and was a showy piano piece, mid-tempo with dreamy sax behind his idiosyncratic playing, something which wouldn’t have been suited for our needs down the road. But this side WAS suited for those needs as it gives us the Amos Milburn we’ve been craving, a driving boogie with heavy left hand holding down the bottom, some flashy work with his right and Davis blowing a steamy sax which is prominent enough that he rightly could claim an artist credit in his own right if he was so inclined. As we know the saxophone was still rock’s most crucial showpiece and it rides that sound for all its worth while the give and take between them sets this apart from some of the more sweat-drenched instrumentals that have come to define rock’s first two years. Two years… the same two years that have passed since these guys laid this track down to begin with. Despite that vintage it’s amazing how current this still sounds in June of 1949. Although there’s nothing exceptional about it every aspect of Pot Luck Boogie nevertheless fits perfectly into the sounds that were pouring out of every jukebox from coast to coast. Milburn sets the pace with his solid left hand and is buttressed by solid but discreet drumming. When he gets a standalone spot mid-way through both hands fly with suitable passion, the urgency of his playing evident in the bass keys being thrashed with fury as he steps it up while the right hand hammers away on the treble keys as if he was taking particular glee in torturing them. During this frenzied workout Gene Phillips is adding subtle licks on his electric guitar which lends another sound texture which was arguably more at home in the rock landscape of spring 1949 than that which existed in the fall of 1947… another subtle reminder about just how forward looking these guys were. Meanwhile Davis, laying low until they calm down some, comes slithering back in with a sultry feel on his horn, not honking and squealing as has been the path to the top of the charts, but offering a feel that was entirely fitting all the same, bringing with him a sensuality that the other side of the rock instrumental coin had occasionally featured. Of course by this time songs like this were old hat conceptually and so no matter how well it’s played – and no matter how welcome it is to hear Milburn cutting loose – this wasn’t going to be the side that garnered the most notice, nor was it meant to be as all of their promotional muscle was aimed at vaulting In The Middle Of The Night to the top of the charts. But at a time when artists were limited to two songs per release – since there were no albums to explore additional facets of their talents – the mere fact that something as primal as Pot Luck Boogie got a chance to be heard was cause for celebration. Too often when an artist is successful with one approach and then is equally successful following it up with more of the same, record labels, especially in this era it seems, suddenly lost faith in the artist’s ability to connect with anything BUT carbon copies of the sound and style they first struck gold with. He’s had two straight ballad hits and the top side of this was another in that vein, so this breaks up the pattern nicely even if it wasn’t destined to be a hit in its own right. But while it may just be an average record in the big scheme of things, serviceable filler if you will, it did show us a few things worth noting. The first of course is reminding us that Milburn was indeed a skilled pianist who wasn’t going to be entirely reliant on his vocal chords to earn a living. The second is that the band itself, sessionists though they were (albeit regulars working alongside him), were among the best in the business and their continued presence gave Milburn’s work a consistency that fans were growing to rely on. Mostly though what Pot Luck Boogie showed, although only in retrospect once we have the recording dates, something the public at the time wouldn’t have had, is that all of them, Milburn, Davis, Phillips and the rest, had their fingers on the pulse of one of the main arteries of rock long before there was even any proof that it would be able to sustain life. Though this record doesn’t elevate Milburn any higher than his already lofty perch, it tells us that his ascent to the top of the rock pile was probably inevitable right from the start. 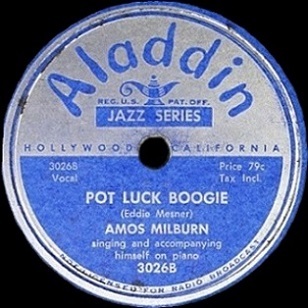 Leave a reply on "Amos Milburn: “Pot Luck Boogie”"